With a name alluding to the traditional system for grading strong beer, XXXX is an Australian brand with a history stretching back to 1924. It was distributed to soldiers overseas during the second World War, where it became affectionately known as 'Barbed Wire' due to the shape of its logo. It is also known as 'Fourex', or simply 'Gold'. 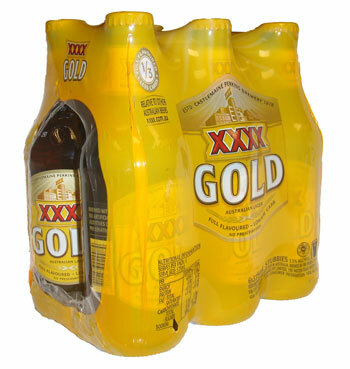 In more recent years, XXXX Gold has become the best selling beer in Australia. This mid strength lager has a mild bitterness and malty sweetness, followed by a crisp, light finish. Takes me back to my backpacking days. Sadly the UK has taken this drink off the supermarket shelves many years ago but thanks to sanza.co.uk I can now purchase this drink again. Managed to get this when visiting Oz a few years back and it brings back all those great holiday memories. Well done sanza.co.uk!! Superb beer, very refreshing and crisp brew with no aftertaste. Would only taste better if I was in Queensland drinking it with my Aussie mate. What a bargain fast service great larger takes me back to those hot days in aus .